I read the abridged version when I was younger. Watched the movie sometime ago. I will read this as I bought the book a few years back but never got around it. Your review has made me interested again. 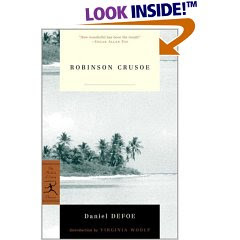 It's been years since I've read Robinson Crusoe. By chance, I picked it up a few days ago and was flippig through it. Having read your review, I now feel the urge to reread the novel. However, my favorite shipwreck story is Mysterious Island by Jules Verne. It's set during the Civil War. The main characters escape from a prisoner of war camp by balloon and are shipwrecked on an island with nothing more than the contents of their pockets to help them survive -- unlike the Swiss Family Robinson who had a whole ship full of supplies for colonization. Classics are just books that take more effort to enjoy, but are totally worth it. I definitely enjoyed it. It wasn't what I expected, but in a good way.